Lacquer, a resin obtained from varnish trees native across East Asia, is composed of urushiol, laccase (enzyme), gum, and other substances. Lacquer, a remarkable type of ecological coating, does not dry easily in places with low humidity. 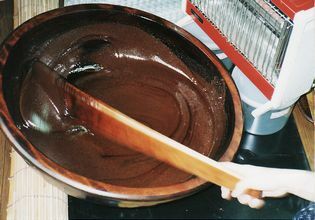 Once the lacquer has been filtered (to remove fine specks of dust and other impurities before it is applied), usually done in the morning, it is usable until the evening. Lacquer collected the previous day may be reused by mixing with new lacquer. Further, adding starch to the mix enables the lacquer to serve as a powerful adhesive. Its strength is clearly apparent in the pottery and other artifacts dating back several thousands of years. For instance, lacquer was applied over rope to secure stone implements and arrowheads to wood by early civilizations. In Japan, lacquer is harvested from the end of May until mid-October by craftsmen known as kakiko (sap gatherers). The number of kakiko has declined over the years; at present, none of the kakiko consider sap-gathering as their main occupation. Last spring, Tsutomu Taniguchi, a kakiko who had been like an older brother to me, passed away. He devoted himself to planting varnish trees and was active as a lacquer woodworking artist in his later years. 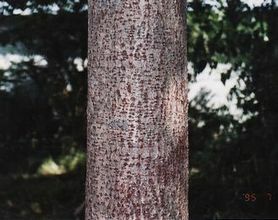 As a kakiko, Taniguchi used to buy between 150 and 200 varnish trees (with trunk diameter of between 15 and 20 cm) each year. These trees were divided into four groups, each of which are assigned a specific day and plot (mountain) for harvest. 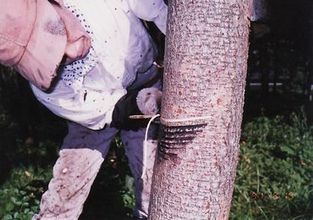 Each day, he would make horizontal cuts in the trunks of between 40 and 50 varnish trees with a kakikama (a chisel-like tool for making incisions), and then using a kakibera scraper, scrape the sap into a champo, a cylindrical container made entirely of Magnolia tree bark, starting with the Day 1 group plot. The next day, he would go to the Day 2 plot, and so on. When a varnish tree is cut, it secretes lacquer sap to heal itself. 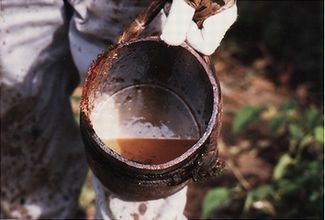 Lacquer sap is produced actively, such that when the kakiko returns to the Day 1 plot on the fifth day, the trees have secreted sufficient lacquer sap for harvest. 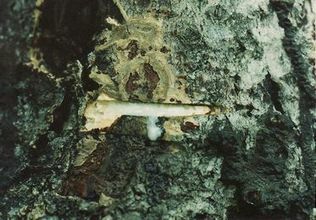 This sap-gathering process can be repeated around 15 times within the entire harvest season. Nature’s yield is incredible. However, even in summer, when the greatest amount of lacquer sap is secreted, and even at the hands of a skilled kakiko, only about 600 momme (approximately 2.2 kilograms) of sap can be harvested per day, making lacquer a precious substance. With the number of kakiko harvesting lacquer declining and the craftsmen who make the specially shaped kakigama sap-tappers already aging such that only one remains in Japan today, Japan’s lacquer industry is in a precarious situation. 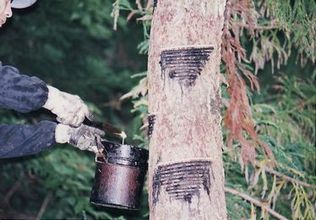 The lacquer sap that oozes from the incisions in the varnish tree bark has an opaque color, similar to diluted milk, and a sweet scent, but if you lick it slightly, you discover that it has a sharp, pungent taste. Freshly harvested lacquer is composed of approximately 30% water—by no means can it be described as viscous. 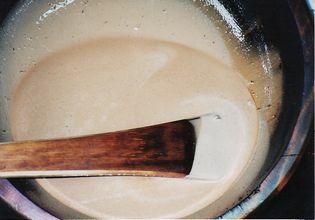 To transform this lacquer sap into lacquer suitable for use as coating, it must undergo a process whereby the lacquer is heated and stirred for the water to evaporate. The refining process used since ancient times is called te-kurome, although another refining process can be used as well, in which the lacquer is heated indoors using machinery called kikai-kurome. In either case, the most important consideration is the type of lacquer the lacquer artisan intends to make. Depending on how this important process is carried out, it is possible to create lacquer that dries slowly, lacquer with a natural gloss, or transparent lacquer. Over several years when I was young, I had the experience of carrying out te-kurome early in the morning under the guidance of my teacher, Senro Sato. It is only now that I have finally come to understand my teacher’s advice on the type of lacquer we were trying to make. Crucial to the te-kurome process are experience and a passion for creating lacquered objects—the desire to coat objects with a certain type of lacquer. In the concentration process, the liquid content of the lacquer is reduced from around 30% to between 2% and 3%. Viscosity increases slightly, and although such lacquer can be used as coating, it is safer to leave the lacquer to mature for two to three years to allow the viscosity to increase. Nonetheless, I find it exciting to use recently concentrated lacquer that has little viscosity. This may be similar to the sensation experienced while drinking beaujolais nouveau wine. In any case, lacquers come in all flavors and types. 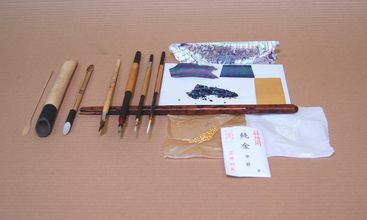 The tools of the trade include brushes for applying the lacquer, such as special brushes used for gold or silver lacquer, and charcoal blocks that are essential for polishing. Japanese paper is also used, such as yoshinogami, to remove dust and other impurities. We who are involved in creating lacquered objects are sustained by special craftsmen, beginning with sap gatherers, who enable us to carry out our work. For excellent quality, the hair used for lacquer brushes is long, firm women’s hair, which seems to be the only juicy part of my story as a male involved in this work. 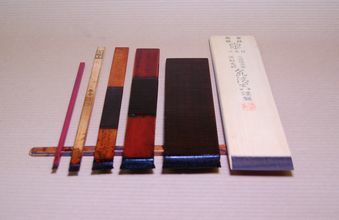 Lacquer brushes are made like pencils, and when they wear down and are no longer appropriate for applying lacquer, the brush can be trimmed as needed. To create the medals for the Nagano Olympic Games, I specially ordered a 1.8 cm-wide brush from lacquer brush master Seikichi Izumi, and I am filled with gratitude toward him. Indeed, lacquer brushes come in many different sizes to suit the size of the objects being coated in lacquer. Unworn hair from the backs of mice is regarded as the ultimate hair for brushes used in applying gold or silver lacquer, which involves drawing extremely fine lines. The uniformity of the mizuge (around 10% of the length of the hair) at the tip of the brush—known as inochige (“life hair”)—determines the quality of the brush. As I am not a gold/silver lacquer master, I do not have brushes using hair from the backs of mice, but it is not difficult to imagine that the art involves dauntingly fine work that is repeated over and over. Charcoal blocks are essential for polishing gold-silver lacquer and cannot be substituted with sandpaper, which is a modern convenience. Only by using charcoal blocks can makie be accomplished: a lacquering technique of polishing gold/silver flakes in the lacquer coating by polishing the extremely thin surface (approximately 0.03 mm). Around 20 years ago, I visited Taro Azuma in Natasho Village, Fukui Prefecture, where he produces charcoal blocks. This process involves more than simply making charcoal—the Aburakiri (Japanese tung oil tree) wood used is carefully selected and thoroughly dried before burning. This special job requires technical knowhow. 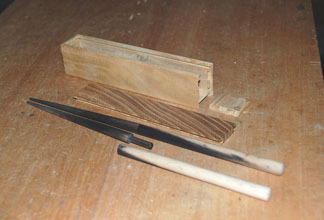 There are still many other lacquer tools. Deeply grateful to the craftsmen who support lacquer work from the shadows, I am keenly aware that I need to devote myself to creating lacquered objects with an attitude of humility to preserve the work of lacquering for the future. Lacquering cannot exist without the base wood (materials) to be lacquered. In my own work, base materials include lathe-turned objects, sashimono (wood joinery), tubs/buckets, and magemono (circular boxes). A lathe is used to shape base materials such as bowls. Generally, the way a base material has been turned identifies where it was produced. 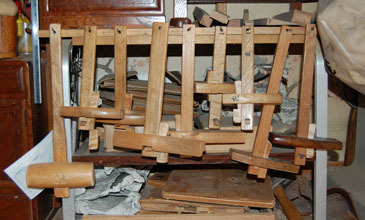 There are two types of wooden base materials: tate-kidori (vertically cut wood) and yoko-kidori (horizontally cut wood). Tate-kidori base materials—which have little warping—are good for creating objects requiring precisely aligned edges, such as natsume tea caddies used in tea ceremony, whereas yoko-kidori materials are perfect for creating generously large and thick bases. With regard to wood joinery, Edo sashimono is highly famous, but under today’s harsh living conditions for furniture, with floor heating and other considerations, creating furniture using solid wood is extremely difficult. Thus, the time for reconsidering materials is truly now. Unlike lathe-turned objects, which are made by hollowing out pieces of solid wood, nothing is wasted when creating tubs/buckets. Since the ancient times, a large range of tubs/buckets have been used as base materials, from small pails to large bathtubs; they are valued for sustaining Japanese culture. In particular, the form of tubs bound snugly with bamboo hoops is both functional and beautiful. 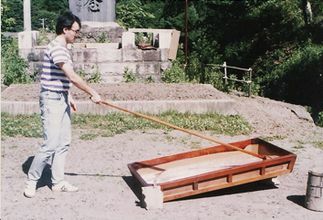 Another base material used is the magemono, a specialty of the Kiso area. As in the case of tubs/buckets, nothing is wasted when creating these boxes. A magemono features thin edge-grained materials that are bent and shaped, with a piece of board inserted as its bottom. Representative of these boxes are the mempa—a lunch box unique to the Kiso area—and circular trays. Japanese cypress wood is regarded as the best material for creating these objects. Although thin wood is important in easier bending, a certain amount of thickness is nonetheless required to ensure the strength of the box. Thickness depends on the desired shape and size, this delicate balance between shape and thickness is the source of the beauty of magemono base materials. Lacquer craftwork is believed to have begun in Japan, and it is no exaggeration to say that lacquer techniques, represented by makie, have been perfected in Japan. Looking toward East Asian countries where varnish trees are grown, Myanmar boasts of lacquer craftwork of beautiful wickerwork woven from bamboo and other materials. 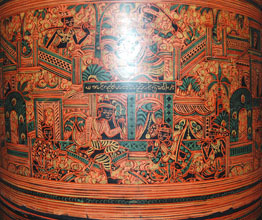 These are covered in lacquer by hand, without using brushes, and then applied with intricate “Betel” decorations. These objects are highly fascinating, wonderful works of art. Examining objects from other countries in this way, I recognized that things made with simplicity may be considered art as well. 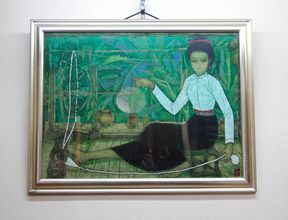 When I visited China in 2007, I saw numerous Chinese lacquered pictures. The artists did not completely polish their finished works—as is expected in Japan—but rather completed the works as pictures. This surprised me immensely, but on consideration, the artists were using lacquer merely as a method for expressing their art. I belatedly thought, Couldn’t Japanese artists also be more freely creative, without being constrained by various restrictions? Although the basics are important in any country, Japan observes Japanese-style lacquer craftwork, and the same applies in Myanmar; different craftwork styles must be properly acknowledged as part of each country’s culture. The beauty of objects is truly mystical.